I was going to post this in General at first, but it is more of a rant than a question, so I figured it might be more appropriate here. The gist of my rant is this: I think I got completely ripped off in terms of Physical Education in High School. I also suspect the vast majority, probably like 95%+ of American youth are similarly getting ripped off. In short, we are taught nothing about how our bodies work. I think that everything I know about what my body can do I learned in the last 6 months. What got me thinking this was 6 days ago when I messed up on squat. Near the top of the push I felt something go wrong in my lower back and knew I was done for the day - I'd hurt myself. Not badly, no getting stuck in bed or anything. I was more angry at having to stop than upset about pain or anything -- the pain was in fact very mild, but not to be ignored. Turns out I was arching my back ever so slightly, and straightening it at the top. This got me thinking about one day in High School when the coach had us max out on the squat, without ever instructing us on how to do it! It was kind of, "walk up to the bar, heave it onto your shoulders, squat down and stand up." That was it. It's amazing we could all walk out afterwards. Now there is one thing about the lower back that I'm not sure is usually spelled out exactly, but it seems to be that this is a muscle that does its work by not flexing. If all you know about your body is what you learned by watching somebody do curls and use a fly machine you would think all muscles work by flexing. And who could blame you? That's what I thought. But all back exercises warn you to keep your back straight. Huh? Then how does it get exercise? If I put two and two together by reading instructions for deadlift, squat, planks and bridges, it suddenly goes "ping!" and you realize you can exercise a muscle by just holding it tight, and it seems this is how the lower back works. (Feel free to correct me if I'm wrong). I also realized after messing up the squat that though I was annoyed and in very mild pain, I was not panicked. I wasn't freaking out that I'd "hurt my back", which is a kind of universal fear among American men similar to being captured by aliens -- something we are taught to fear and avoid but not to respect and understand. OK, maybe you can't respect and understand non-existent aliens but I hope you know what I mean. But after lifting for 6 months and feeling this bad pull I just thought, "Hmm, let's do some stretches and feel out how bad this is, try to localize it, and find out if there is are any rehab exercises to speed recovery." So tomorrow I go back to squats with more confidence instead of less. Really just had to get that off my chest, why can't we teach kids to understand and respect their bodies and their many possibilities? Funny thing, at the same high school, which actually gave me an exceptional education except for this one failing, we once watched some show on the Greeks where they read a passage from an ancient who said something like, "What a shame it would be for a man to grow old and never know how beautiful and strong his body might have been." I guess it was all ideas though, nothing practical. One more positive point to end this rant: It is by stretching the possibilities that we find out what we can do -- but that carries risk, the risk of a mistake. But even in a mistake we are so far ahead of where we'd be if we never tried. You can avoid all injuries by not pushing yourself, but what is that but paralysis? Nice little rant there Ken. I agree whole heartedly with you except for one thing - my regular education sucked through high school as well. It hasn't gotten any better lately either. I have several friends who are teachers and coaches. What you describe as your experience with the squat is about the same that is being done today (I'm sure with some exceptions). You got to squat in PE at school? Bloody hell, we had like 3 treadmills and that was it! DavidMcF wrote: You got to squat in PE at school? Not only that but once we got to lift. The coach spent the entire class getting 3 guys to spot him, and once in awhile he'd get up from the bench and yell at us all that he expected us to "Lift! 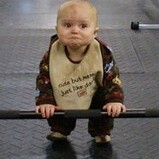 I want to see you lifting!" In our school district in NY you had to have 4 years of gym everyother day if you missed to many days you had to take it every day instead of even odds in order to graduate. I moved out here to Oklahoma, people here could have taken orchestra and never take gym at all. We had a weight room In High school a pretty good one I wish it was more accessible though. PE at High Schools in Australia (or NSW at least) is shocking. When I was coming through we did maybe an hour or two a week? And all we did was stretch, run around an oval and then play some sport like Netball or Touch. A school having a Gym/Weight-room was almost unheard of unless you went to a private school. With the looming obesity epidemic (or is it current...) it seems there should be a push for getting kids to better understand how their bodies work and get them lifting! Velcropop wrote: PE at High Schools in Australia (or NSW at least) is shocking. When I was coming through we did maybe an hour or two a week? And all we did was stretch, run around an oval and then play some sport like Netball or Touch. A school having a Gym/Weight-room was almost unheard of unless you went to a private school. With the looming obesity epidemic (or is it current...) it seems there should be a push for getting kids to better understand how their bodies work and get them lifting! And yea - it was always the activity itself, never sports science or diet. I'm not claiming I could outfit a nation with a good solid PE syllabus but I am saying I wish there was more education involved and less forced mindless cardio. The real learning is at home with the parents, school is just a supplement, although a very important supplement. That includes Physical Training as well.